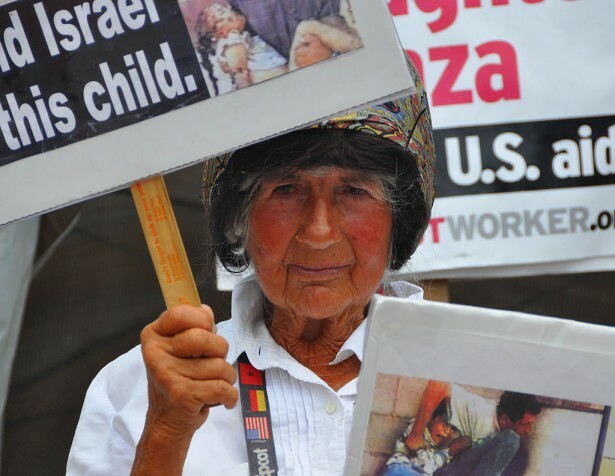 After camping outside the White House for 35 years — in the nation’s longest-running protest against American militarism — Concepcion Picciotto has died. At her death at age 80 in a Washington assisted living center on Jan. 25, Picciotto, a Spanish-born pacifist, had staged the nation’s longest-running 24/7 protest against American militarism. The site became known as the Peace Park Anti-Nuclear Vigil. Blizzards, downpours, lightning bolts, heat waves and other inclemencies came and went, none of them a match for the willpower of Picciotti. Activist allies would join her, either to let her take shower breaks at nearby facilities or help her pass out literature to tourists passing by the encampment. Among the international groups that unfailingly showed up, as if paying homage to a shrine, were those from Japan — grateful that at least one American grieved the August 1945 horrors of Hiroshima and Nagasaki. As visible as the vigil was — critics denounced it as an eyesore and supporters hailed it a light shining in the nuclear darkness — Picciotto’s stand was politically grounded in what was called Proposition One, a proposed constitutional amendment legislatively requiring nuclear disarmament and the disbanding of weapons companies. The bill, meeting with near-total disinterest by the denizens on Capitol Hill, never came up for a floor vote. Even though the peace vigil could be seen from the West Wing of the White House as well as the second floor residence, none of the five presidents from 1981 to now — Ronald Reagan to Barack Obama — ever bothered to stop by to say hello, much less host her in the Oval Office. The establishment media largely dismissed her as an eccentric, never booking her for a spot on the Sunday morning talk shows. Nor did the editorial boards of the New York Times or Washington Post invite her in. Others were more appreciative. In 2011 Picciotto received the Joe A. Callaway Award for Civic Courage presented annually by the Shafeek Nader Trust for the Community Interest. More than once I brought my students to the vigil to meet this wonder woman. Connie, as I and many other admirers came to call her, was ever gracious and modest. She told stories of her many run-ins with the Secret Service and hassling park police. For my students, I thought it was educationally better for them to see a sermon on peace than hear one. Just War or just more slaughter? people who instigated counter-demonstrations across from us. After a dozen or so counter demonstrators they stopped making the effort whereas a half-dozen peace demonstrators continue to show up each week for a one hour demonstration. This has gone on for 15 years so I am in awe of Conception Picciotto’s determination to maintain a daily Nonviolent presence near the White House. I am so glad that “Connie” is getting the acknowledgment she deserves for her firm, to put it mildly, commitment to Peace and non-violence. What an example of a woman living her Gospel convictions at the center of her life. Thank you for writing about such a monumental activist. We all share the responsibility for allowing things to be by our silence or compliance. A n inspiring story. What a statement that no president ever met her. So any people are invited to the White House. Wonder what Harry would have done? I had not heard about Concepcion before reading this paean, but that doesn’t matter because she was always there, faithful to love and peace. And we may never hear of the hundreds and thousands of of good people, the quiet and even not so quiet activists, who transcend fear, ego, insecurities to know, whether alone or in a group, they stand on the principle of justice for all the human and environmental family. I salute the grandeur and generosity of Concepcion’s spirit.